Madeley’s old Village Hall was becoming expensive to maintain and did not provide the facilities that were needed in the village. The Scout hut was becoming unsafe and the floor was rotting. For ten years, a small committee of volunteers worked towards securing the land for a new community building to serve the village and surrounding areas and provide facilities to enable local people to run activities and events for the benefit of the community. During the project planning period, the council decided to close Lea House, an old-people’s residential home on Furnace Lane. The closure left the village and local area with fewer residential beds for elderly people needing a level of care. The project team managed to negotiate with the council to buy the land upon which Lea House had been built to use for a new Extra Care facility – Lea Court, built and run by Housing 21. It has 63 two-bedroom apartments to buy or rent and allows over 55s to live independently whilst receiving the appropriate level of care they need from an on-site team. Once the old village hall was surrounded by builder’s fences and the diggers moved in, rumours flew around the village that there was to be a development of 180 houses. But thankfully, this was not the case, though it could have been, had the land not been secured for the village by the project team. 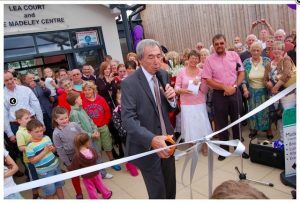 After masses of hard work, a number of consultations with local people and a lot of excellent negotiating with councils and funding providers, the first turf was cut in late 2009 by our local hero, legendary footballer Gordon Banks OBE and building was underway. The centre was officially opened by Gordon at 2pm on 11 June 2011. The Madeley Centre and Lea Court form a fantastic facility for the residents of Madeley and surrounding areas for now and into the future.